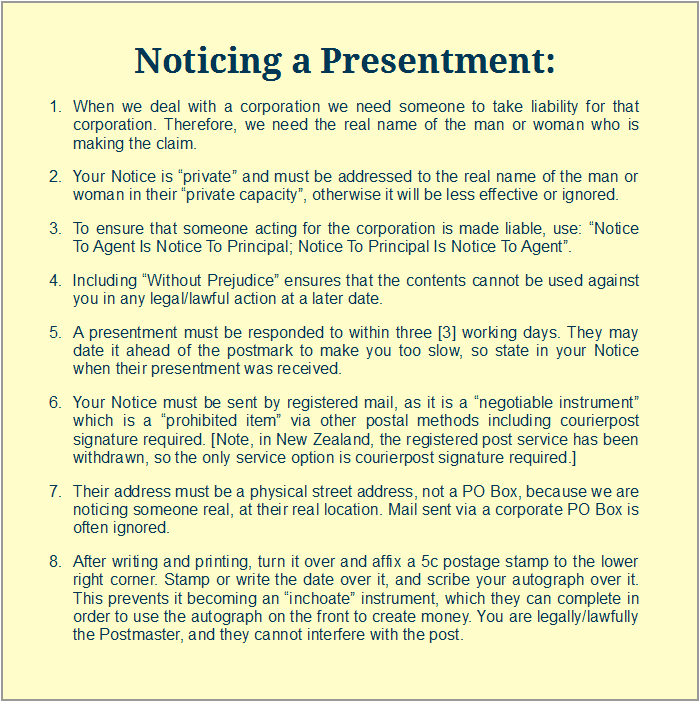 A presentment is a written “demand for payment”, or for a “performance”. 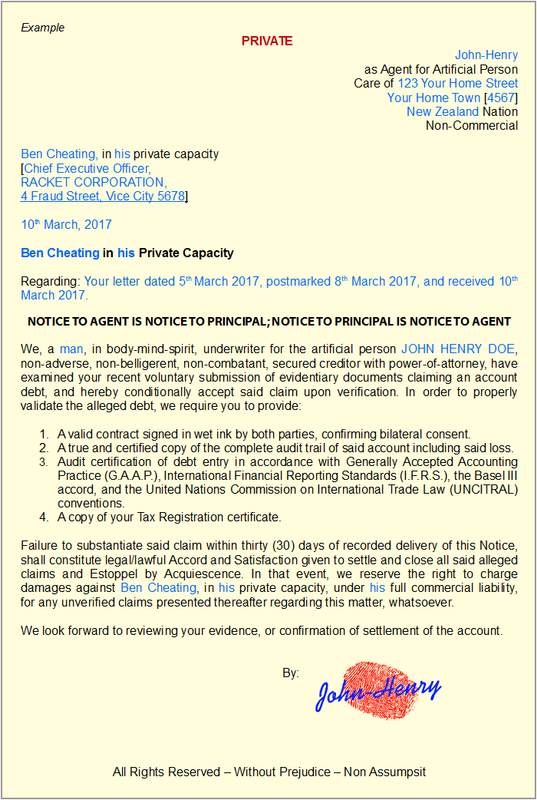 Presentments addressed to the artificial legal “person” NAME, are often in all-capital-letters and/or with a fictional title such as “Mr.” or “Mrs.”. They are not addressed to a living man or woman. All presentments that arrive in the post addressed to the artificial legal “person” NAME, sent by incorporated governments/corporations, are offers of contract made to a living man or woman. This is because incorporated governments/corporations are legal fictions, and so they can only contract with other legal fictions. They NEED a living man or woman to step forward to take responsibility for the liabilities attached to the NAME. In this way, a private man or woman in their “private capacity” can contract to “act” in a “public capacity” in the “role” of an artificial legal “person” NAME. Every type of artificial legal “person” including “resident”, “taxpayer”, “driver” etc., is a debtor, and surety for the corporate national debt, in the debt-money system. Most people are unaware of their living “standing”, and unwittingly “act” in “joinder” to the artificial legal “person” NAME which is a “creature of the State” under statutes. requiring JOINDER to the artificial legal “person” NAME. Private men and women have an “inviolable” and “unlimited” power to contract, or not to contract, and therefore can decline a presentment. Your silence is tacit acceptance of a contract, so nothing is gained by ignoring a presentment. If you do not wish to accept any Privilege or Benefit offered in a presentment, you can return it within three working days with a label over the address window: “NO CONTRACT – RETURN TO SENDER” or “CONTRACT DECLINED RETURN TO SENDER (CDRTS)”. Remember that a presentment addressed to an artificial legal "person" NAME is not addressed to a living man or woman, so it can also be returned: “ADDRESSEE NOT FOUND", or “UNCLAIMED POSTAL ARTICLE”. However, it is more effective to respond with a Notice of Conditional Acceptance. Such a Notice rebuts a false claim not by disputing it, but by accepting it upon verification. In this way, you stand in peace and honour, while the burden of proof is on the claimant, where it belongs. If a claim cannot be verified with evidentiary documents, it cannot be legally or lawfully enforced, and any further claim places the claimant in dishonour, compounding their wrongdoing, making them liable. To inform them of the consequences of their potential liability, you can include a Fee Schedule in your Notice, and ultimately you can invoice them for any breaches, although do not expect them to be honourable. It is important to keep records of paperwork and postings (including receipts), and to be systematic and patient. If the claimant cannot verify their claim within a reasonable time, usually thirty (30) days, they have failed. At this point you have formed a binding agreement at law in which the claimant has been “estopped”, which means they are legally or lawfully prevented from further asserting their claim. Even so, legal actors may ignore your Notice(s) and continue to send presentments, or they may send intimidating letters in legalese, or they may threaten to pursue legal action in one of their commercial courts, all of which are merely repeated attempts to contract.